The new Dropbox Android app plays nicely with KeePassDroid. I use Dropbox to synchronize my keepass database, because it is available on all of the platforms I use daily: Linux, Windows, and Android. 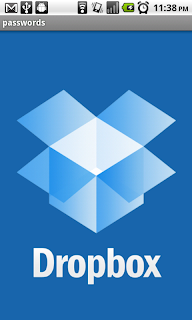 In the background the Dropbox app will be waiting to see if you make changes to the database. If you do, it will upload your changes back to your Dropbox. Sorry to keep you all waiting. The new version of KeePassDroid has beta read-only support for .kdbx databases. I haven't exposed the additional fields this format supports, yet. I'll slowly get it all in. Please keep backups and help me shake out the bugs. Thanks to @kibmcz for the new icons.